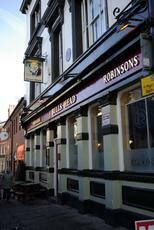 Closed on our last Stockport pub crawl (29.03.14). I was in the day after Supreme_being, my Dark Hatters was fantastic but the Old Stockport was a little sour. If the landlord had've been in I may have taken it back but decided it wasn't worth the hassle. I wonder if they are trying to keep too many beers on for the turnover? �2.10 a pint is easily the cheapest Robbie's pub worth going in, though, and on previous visits it has been on top form. The food was good, too, despite it being the new chef's first day. What to see a good rock band then go to youtube and put bassmanphil3 in the search bar.